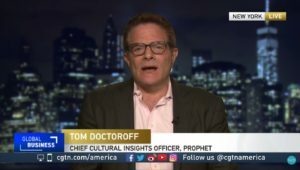 Marketing guru Tom Doctoroff denies stories about a downgrade of consumption in China, as some assume. There is less bling in the bigger cities, but the rest of the country sees more consumption as people just get enough income to start consumers, he tells at CGTN. Tom is the author of What Chinese Want: Culture, Communism, and China’s Modern Consumer.